Ecogrease is for quick release pins, seat posts, pivots, bike building and other grease applications. Grease will get on your hands, so ours doesn't contain Teflon/PTFE or petrochemicals. In fact we've had mechanics call in to say thanks, having suffered dermatitis in the past from the toxic brands out there. How to use Ecogrease The first formula of Ecogrease was a little thinner, but its now thicker and more durable. We therefore recommend taking the whole cap off to squeeze it out if you have the bottle version. 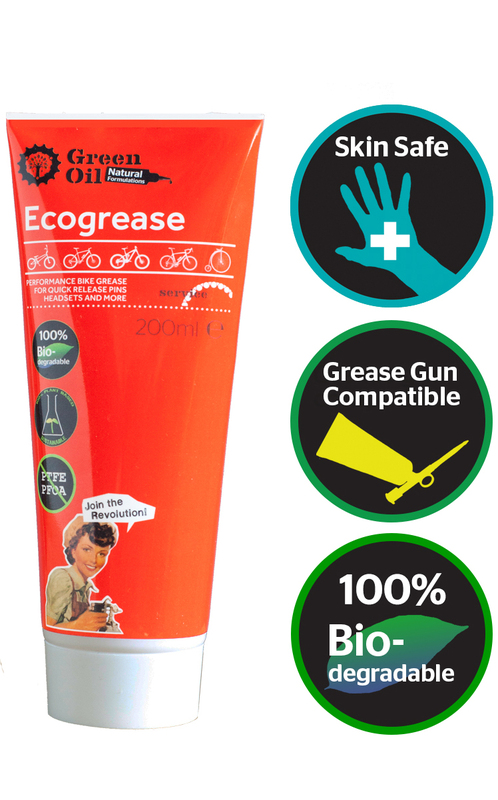 Ecogrease is used on the assembly line of a couple of bike companies now, for a healthy workforce. And is now Grease gun compatible. - Ecogrease contains no PTFE or petrochemicals. - Review at SingleTrackWorld.com 2016. Click for full review. - Review by Michael Stenning of Seven Day Cyclist, 2016. Click for full review. - Review by Brian Palmer of the Washing Machine Post, 2016. Click for full review. - User review on ChainReactionCycles.com. "Only used a few times so far but its pretty good. Wasn't sure what to expect but it's fine for mech joints etc." ".It does the job very well." " Durable, Great Value, High Quality"
"Certainly a lot easier to clean up than copper grease, and doesn't leave you with dirty hands!" - A selection of user reviews from Wiggle.co.uk. - Review by Mountainbike.Be, Belgium.